We have over 600 Five Star Reviews! See why My 1st Choice Movers is San Diego’s preferred moving and packing company. Click here to get a free estimate now. 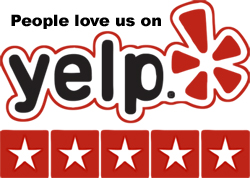 To read more reviews or write your own click here to go to Yelp. This was the best moving experience I have ever had, the were early, ready to get going . Jose Rob and Junior were up beat , a joy to be around will at work and super helpful when it came to getting thing situated. Never at any point did I see them slack off or let up on the work to be done . We had way more then we had thought and these guys knocked it all out , and all with a great attitudes and smile on there faces the entire time, even though we had a lot still be done they took it in stride and kept it moving forward. Just completed a two-truck move including packing. Derek was great. He put my mind at ease, especially when other movers came back with very high estimates. The work was done within the estimate. The teams did a great job, very careful with our items and very nice people. Thank you! I want to clarify, I don't write REVIEWS! However, I am today. Derek, responded to my Angie List quote for movers within an half hour. From there my customers service was professional and he was fair! Roy and Rob, were pleasant and work fast! My belongings were handled with care. Overall, my experience was PERFECT! Moving is a hassle, but not this TIME! Moving Is very stressful and Derek and his team made the process so much easier every step of the way from the initial estimate to moving day with their professionalism, timeliness , hard work and communication . We highly recommend this company! The pleasure was truly ours to have to hire 1st choice for another move within a 12 month period. While I thought there was no way Derek could exceed his team from last time, he did. We had 5 great guys, Beto, Ruben, David, Lyle, and Salvador. When they arrived, they were all smiles and ready to get to work, as if they actually enjoy moving! It is great to see people happy to do their jobs. They were actually excited there was a safe to move! Better them then me, I say. They were quick and efficient. The only thing that bums me out is that we bought this new house so we won't be moving again for some time and need their services. However, that means they are available for you to hire! I have used 1st Choice Movers many many times... Moving precious China and high end furniture around is not easy.. But BIG Derek (The Owner) has made my life very easy.. I can always count on his muscles to help me out!!! I remember when he moved my fridge by himself. When he first started the business... It was up flights of stairs... My old roommate and I attempted it, I almost dropped the fridge on my roommate... Literally! The fridge sled back down the stairs and good thing my old roommate was a TrackStar because he quickly jumped over the Fridge!!! I almost killed my old roommate trying to my lift my fridge up a flight of stairs... After that incident... I looked movers in my area and found Derek online... Since then he has been my moving guy!!! These guys are the best movers that I have ever used! With all of the positive reviews, how could I go wrong? I called them and had constant communication with Derek via phone and email and felt reassured that everything was going to be taken care of (which it was). There were no issues and when I unpacked everything, nothing was broken because it was wrapped so well. Fast forward a year later when the lease was up on my apartment. The only place that I called and thought about was 1st Choice Movers. They helped move my wife and I from Imperial Beach to Chula Vista (yesterday) and did a super job! I was especially impressed when they had to push my couch (at the new residence) up and over the balcony (on the second floor!) when it couldn’t fit through the front door. My wife had surgery recently and because I work during the week, I never would have been able to pack (and move) everything myself. 1st Choice Movers came highly recommended to me from a friend who had booked several moves with this company. I contacted Derek and he emailed me directly with a quote within 20 minutes. Because of his prompt attention to his customers, securing my move-date & time happened quickly and with no hassle! On the morning of my move, Evan, Stivan, and Ogen showed up promptly at my appointment time and got to work. They came with tons of blankets, wardrobe boxes and supplies to treat my items with care. They were so kind and respectful that it really made the stress of moving so much easier. They finished the job under 3 hours and I was settling in my new condo before noon! I was also amazed at their pricing. Derek had let me know about the 6% discount when paying in cash & I had purchased a Yelp coupon as well. I’ll never use another company to move again! I can’t recommend these guys highly enough! Thanks 1st Choice! I would 100% recommend 1st Choice Movers again. I had the pleasure of working with Stivan an Ogen who were extremely fast, organized and able to answer all of my questions. I can’t even believe I was considering moving myself, these guys made it so easy. They came prepared with wardrobe boxes for me to hang my clothes in, tape, wrap, blankets… you name it. Initially, I had planned to make only 1 stop (my new place) but realized at the very last minute I needed to drop off the couches at a different location (talk about added stress)! Naturally I was nervous to ask the guys, but they did it was no problem and dropped off the couches at the other location with no additional charge. Thank you 1st Choice Movers you guys are awesome!! !